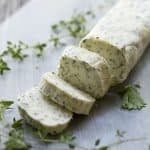 Easy Herb Butter is an awesome homemade condiment to have around!. Just keep it in the freezer, and it’s ready to go whenever you need it! This butter is great on top of anything! Mix all of the ingredients together using a mixer. Plop the butter mixture onto a sheet of plastic wrap, and form the butter mixture into a log shape. Wrap the butter up like a tootsie roll. Refrigerate the butter for at least 2 hours before using. Store in the freezer for up to 6 months!